On Lost Sydney this was recently published. 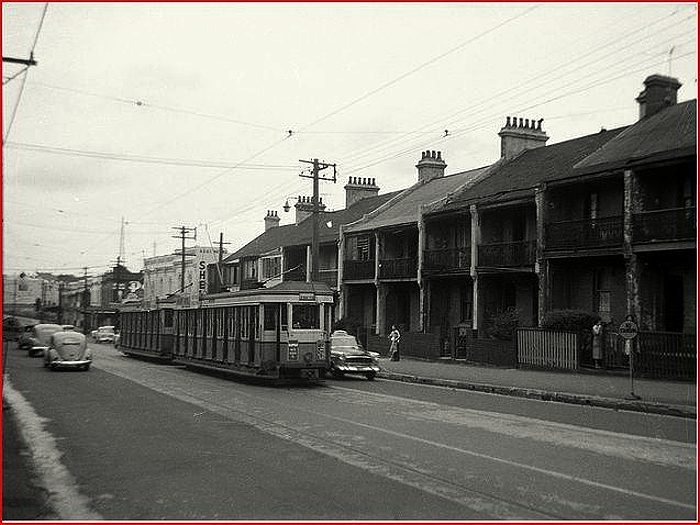 A Railway-bound tram in Cleveland Street in 1960 – but where? My bet is that this is looking east and that the building behind the trailing car of the tram is on the corner of Cleveland and Young Streets. When I attended Sydney Boys High from 1955 to 1959 we were supposed to avoid the trams if a school special bus was available – in a toast rack tram, if crowded, our hard Globite school cases were something of a public nuisance, let alone our sweaty bodies… Here are some girls from Sydney Girls High around the same era: see High School Memories. Nonetheless we often caught the tram. Cleveland Street, just past Crown and Baptist, looking east. On the left you can see Nickson Street. On the other side of Sydney High, Anzac Parade and the dedicated tramway by the Cricket Ground and Show Ground. These were taken on 25 February 1958 when The Queen Mother was visiting. I remember that day. Yes, it was hot… Note the kids sheltering under the trees. 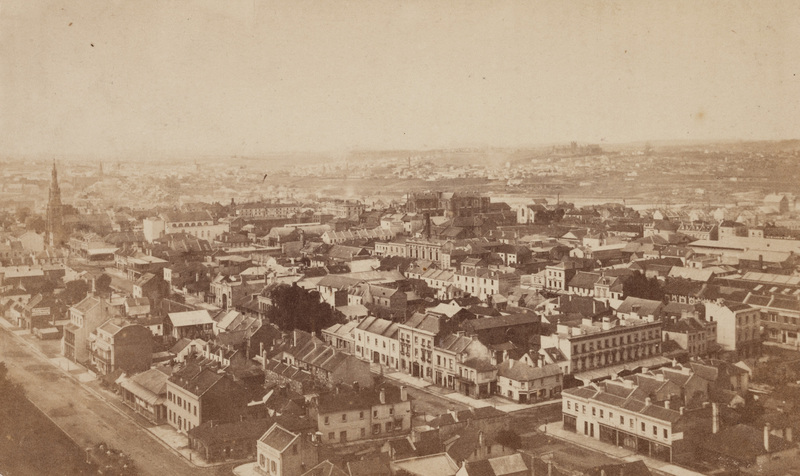 Picture sources: City of Sydney Image Library; Bus Australia; Trove. Do visit Shooting Through : A fond remembrance on Sydney Eye. Always and ever the Golden Age — Χρυσόν Γένος — has been an illusion. It is important to remember that. But of course that view is not only because this speech still thrills me, but also because of where my life was at that time, 1993, when (for example) my 50th birthday was the sweetest I had — ever, possibly. At that time too I was locked in battle with the Immigration Department on behalf of M — a battle we won — an experience that still colours my views on more contemporary issues. I do not see the advent of Howard and Pauline Hanson three years on as ushering in a golden age of any kind. I never could and never will. The end of the second world war ushered in an era of incomparable economic growth. In the era of post-war reconstruction the world’s developed countries would enjoy a ‘golden age’ of low inflation and full employment. Guided by the theories of John Maynard Keynes, governments became increasingly confident in how to apply macroeconomic policy. Then Strategy in Australia’s Golden Age 2011-2020 puts us right inside one right now! Perhaps 1988 was the Golden Age. I lived opposite The Beauchamp in 1988-9. The above is from a little later. Sirdan would recognise these people. Was this part of a personal Golden Age? Yes and no. Aspects were, but there were also other aspects that were as bad as anything I’ve known. Which just goes to show the Golden Age is usually a product of nostalgia and wistful rearranging of history. That applies to personal as much as political ones. I see I have a tag here for nostalgia but I have rather neglected it, as I am sure far more posts would qualify – all The Shire ones for starters! There are still patches that are little changed since I lived and worked around Dapto and The Gong in the 70s, or for that matter since my Dad was born at Shellharbour 101 years ago. But the area is nowhere the dairy hub it was. 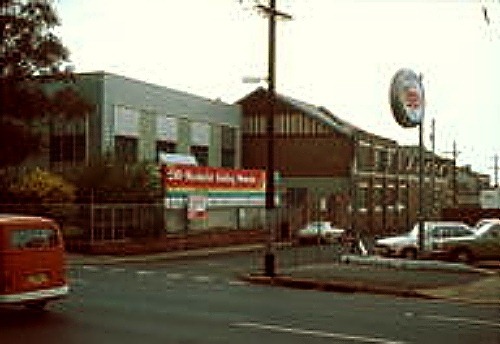 The old Dairy Farmers’ Co-op at Albion Park is witness to that. View between Albion Park and Dapto, from the train window last Monday afternoon. God’s Politics has a nice companion post today. Comparing today with yesterday is a popular yet pointless pastime. For one thing, we rarely remember yesterday accurately. More to the point, yesterday was so, well, yesterday — different context, different players, different period in our lives, different numbers, different stages in science, commerce, and communications. Seeking to restore the 1950s — grafting 1950s values, lifestyles, cultural politics, educational, and religious institutions — onto 2012 is nonsense. It sounds appealing, but it is delusional. That world didn’t disappear because someone stole it and now we need to get it back. It disappeared because the nation doubled in size, white people fled racial integration in city schools, and women entered the workforce en masse. It disappeared because factory jobs proliferated and then vanished, prosperity came and went, schools soared and then soured, the rich demanded far more than their fair share, overseas competitors arose, and medical advances lengthened life spans. The comparison worth making isn’t between today and yesterday. It is between today and what could be. That comparison is truly distressing, which might explain why we don’t make it…. What is it about nostalgia? I think it really is about our own mortality. I am intrigued by phenomena like these two Facebook pages, both of them very active and very popular. A truly lost Sydney. This was recently posted on the Lost Sydney page. very few of the buildings seen in that photo survive. And while much that is heart-warming, funny or fascinating surfaces on Lost Gay Sydney, so does much that was truly tragic and not worth the bother thirty years ago, let alone in resurrected form. Funny world, isn’t it? Yesterday I became quite nostalgic – some of it I think for good reason – about the cows of yesteryear as I trained through Albion Park and Dunmore/Shellharbour. But the past really is another country. That’s it. I am no longer going to pursue rants expounding “my pointless point of view” on this blog. We’d all be far better off reading The Guardian Weekly on paper with all our electronic devices switched off. That way we may find ourselves reading about rather more than our own pet peeves and projects. You’ll have noticed, I imagine, that I have been moving away from the rant, only excepting at times one or other of the exchanges I have had with Kevin from Louisiana – by far my most prolific commenter with 279 to date on this blog alone and 104 on its predecessor. The latest exchange was about Andrew Bolt, of all worthless topics. If you have the stomach for it find it here. But I really am tired of the way the blog has so often had to post the same thing – with variations – over and over again, a bit like the smart crack about Q&A on The Hamster Wheel last night: where the same question is asked week after week after week… Mind you the last Q&A was brilliant, among other things showing what a third-rater Greg Sheridan is. See A very dangerous Q&A. I have book reviews to catch up on and TV really is rather interesting lately. Yum Cha–the last one of the millennium–and James’ birthday. The food at The Golden Harbour was fresh and plentiful. PK (whose handover of the goods collected by the Gifting Tree takes place tonight), the Dowager Empress, James, Rhodesia D, and myself. A nice break. Two days of school to go. The HSC results and UAI (University Admissions Index) results come out Monday and Tuesday and I am very interested to hear certain ones 🙂 The hopes, fears and aspirations of some involved in this I have got quite involved in–some I have known now for quite a few years, and others I have known more recently. I was reminded particularly of the events of the past year/months when I got a message from Shanghai Bob, who has been in Melbourne being interviewed for medical school, and saw the current note on Mr R’s ICQ information. Then the Annual Unemployment, and, a thought I am still facing up to, the inevitable move. Prior to where I am now, the longest I have lived in one place was my place of birth–seven and a half years. I have exceeded that record here in this little apartment in Surry Hills, but it very much looks as if that is over, with only the details and legalities to be arranged. That’s how things stood last time it was discussed anyway. A dream has died too, or rather the dreams of others have long since moved on, and no-one is to blame. Send positive vibes nonetheless please. Christmas I will probably spend with the Dowager Empress. 10 pm: Just back from the Carols Service/ Gifting Tree handover at Taylor Square, the major intersection in Sydney’s gay district. The Gay and Lesbian Choir were great (a colleague up in the back row), Vanessa Wagner (the master/mistress of ceremonies) very witty, the Mayor wonderful, and PK spoke very well. A lovely night. Fireworks at the end, the "Hallelujah Chorus", and quite a crowd of gays, lesbians, and mums, dads and children. It was a night to remember with pleasure. What I was worrying about there didn’t eventuate, by the way, or not in the way that I feared. Clearly I was in Surry Hills for another ten years after that. Oh, and “Rhodesia D” = Sirdan. Well, what a Yum Cha! Frankly, I was not feeling well this morning, but Yum Cha soon changed that. A record attendance on this last day of the Olympic Games. Seventeen people–so I won’t list them all, but one Indonesian Olympic visitor, the regulars (PK, James, Ian Smith, Rhodesia D, Bruce, Clive) plus Simon H (a friend and ex-student of mine, whose friendship now goes back over 20 years), Tim K (a person I met about 14 years ago) whose personal odyssey is fascinating, and most pleasing of all Mr R and Delenio. A lovely way to spend Sunday morning. And the Olympics Closing Ceremony is in progress as I write. Soon the sound of fireworks will fill the night here and I will go out to look. What a time to be young, Mr R and Delenio, and all my younger friends. What memories to keep! I have such a mixture of feelings, I who was a bit of an Olympics cynic. But it has gone so well. If you are overseas reading this, you just would not believe how good it has been to be in Sydney in the Year 2000–despite, well, the Australian dollar…etc. But bugger all that, as we say in Australia, without the rudeness that might seem to suggest. This has been a good time for the human spirit. I hear now in the background the sounds of indigenous Australia; I scan the list of volunteers and see in that multicultural Australia in action–the Zhangs, the Xus, the Smiths, the Xuerebs…all one! I am a proud Australian at this moment, totally unashamed of this emotion. Wishing my father were here, my mother…my cousin who won gold at Munich and now gone from this life…No more words.. The best Games ever? Yes, maybe it really is so. In that same month is something I undoubtedly forget rather too often. It’s worth reviving. Here are a number of ‘danger areas’ where, often with the best intentions, errors are made and listening becomes little more than a self-centered activity. Placating You want to be pleasant and supportive. You want people to like you and so agree with everything they say. You half-listen, but you’re not really involved. Comparing You are always trying to assess who is cleverer, more competent, more emotionally healthy–you or the speaker? This makes it hard to listen. Identifying You refer everything that you are told to your own experience. Everything you hear reminds you of something you have thought, done or suffered. There is no time really to hear the other person and to get to know her or him. Advising You see yourself as the great problem-solver, ready with help or suggestions. You do not hear more than a few sentences before you begin searching for a solution. Mind-reading You may not pay much attention to what people say and, in fact, you often mistrust it. You spend more time trying to work out what the other person is ‘really’ thinking or feeling. Filtering You listen to some things and not to others. You pay enough attention only to hear what you want to hear. Rehearsing You are rehearsing what you will say next, so you do not have time to listen. Your attention is on the preparation and crafting of your next comment. You continue to look interested, but your mind is at work…elsewhere. Dreaming You are half-listening and something the speaker says triggers a chain of private thoughts. Effort is needed to stay tuned in to the conversation. Listening means concentrating and showing commitment to the speaker. Sparring You argue and debate with the other person. He or she never feels heard because you are so quick to disagree. You take a strong stand and are very clear about your beliefs and preferences. Being right You will go to any lengths to avoid being wrong. You cannot listen to criticism, you cannot stand being corrected and you cannot take suggestions to change. Since you cannot acknowledge that your mistakes are mistakes, you just keep making them. Derailing You suddenly change the subject. You get bored with the conversation or you feel uncomfortable with the topic, so you derail it. Sunday afternoon at the Beauchamp and the Albury. PK, became a little distant as time went on, testimony to the difficulty he is having right now. Tom from Houston Texas was there and told this wonderful if offensive joke: What do you have if you have a room full of people from Arkansas? Ans: a full set of teeth. Rhodesia D. joined us and he and I talked on the theme of exile, which he feels quite deeply. Ian Smith was also there, sparkling as ever. Ian has yet to issue the imperial summons to M; perhaps tonight? We speculated as to the effect of the public Yum Cha announcement above–minimal I suspect, but it is nice to speculate that all these strangers might turn up. I also ran into Cameron, a man I had known at the Britannia Hotel (the first gay bar I ventured into –in 1985!). He was a psychotherapist in those days. I literally had not seen him since about 1988. Since 1991 he has been living in Queensland, currently on an island, and he is no longer a psychotherapist. Fear not: I continue to gather the most intelligent, insightful and reliable commentary I can find in my Google Reader, and a selection from that on Facebook. … and I took these at night in a school down there. And who can forget the movies of the time?